Samsung launched its Galaxy S 4 smartphone to much fanfare at a Radio City Music Hall event that was more Broadway spectacle than the spec walk-through we typically see at major product launches. But as hotly anticipated as the Galaxy S 4 is, it's more noteworthy that this launch reflected how Samsung positions its new “life companion.” While the specs are there in spades, this is the first smartphone in a long time that's not just about specs; instead, it's about the overall, integrated experience. The last time those words were so critical to a smartphone's debut was back in 2007, when Apple's initial iPhone soared past every phone around it, thanks to its innovative interface and integration between software and hardware. Fast forward to 2013. Cell phone makers are fairly constrained by the rectangular designs housing today's smartphones. It's practically a given that a phone will evolve to be thinner and lighter, with a better display and faster processing. And in those ways, the Samsung Galaxy S 4 is certainly an evolutionary product: Tweaked physical design, slightly larger 5-inch display, faster processor (in the U.S., we'll get a quad-core Qualcomm S4 Pro), more system memory (2GB of RAM) and larger internal memory options (up to 64GB). After spending some quality time with the phone at the launch event, it's clear that dismissing the S 4 as merely an evolutionary upgrade is missing the true impact of what the Galaxy S 4 represents. It's the inclusion of subtle things built into the phone that makes for a potentially transformative mobile experience. For example, the phone has a slew of new sensors—a barometer, as well as sensors for tracking humidity and temperature. On top of that, Samsung has integrated a ton of lifestyle software features and apps that are designed to make day-to-day activities easier; apps for monitoring your health and steps, scanning business cards and even translating between nine languages. Whether these are the best-in-class apps may not be the point; the idea is that you don't need to figure out for yourself if there's an app out there to do a particular task; you can now start with what's integrated into the phone. While the S 4's polycarbonate back feels better made than the plasticky back of the Galaxy S 3, it still feels like plastic. It can't compete with the high-end feel of the new HTC One's aluminum sheath, or the silky design of the Apple iPhone 5. Samsung has made the design a bit more angular, too, similar to the HTC One and iPhone 5. I liked the width of the phone; it's practically the same as the S 3, yet holds a larger display (5" versus 4.8"). And the S 4 is thinner (0.31) than either the HTC One (0.37") or the S 3 (0.34), though not as thin as the iPhone 5 (0.30" which beats the S 4 by a hair, just 0.01-inch). It’s impressive that Samsung could squeeze a larger display into practically the same space as the Galaxy S 3, which has a 4.8-inch display. The extra two-tenths of an inch make a visible difference. While there are other phones with a 5-inch display (notably, the HTC Droid DNA) most of the high-profile phones are between 4.5 and 4.8 inches. Samsung gives the S 4 a high-resolution display, too: 1920 by 1280 pixels, and 441 pixels per inch—noticeably better than the 306 ppi on the S 3 and the 326 ppi on the iPhone 5. And, it's competitive with the 468 ppi found on the HTC One. The camera S 4's camera is 13-megapixels, which is higher resolution than many of the top phones available today, but in line with the latest phones shown off at Mobile World Congress in Barcelona last month. 13 megapixels is definitely the new 8 megapixels; but as we've learned in point-and-shoot cameras, it's not all about the megapixels. So the jury is out until we can test for picture quality. Samsung has clearly given a lot of careful thought to how people use their cell phone cameras and what features are missing today. The S 4's most innovative camera addition is its dual-shot mode, which lets you shoot stills or videos simultaneously with both the front and back cameras. This way, the shooter can still appear in the picture. It sounds cool, but I'm not entirely convinced that the novelty of inserting a square-sized image of oneself into a photo will have long-term appeal. Other new features are more competitive than they are revolutionary: For example, a Drama mode for automatically compositing a sequence of shots into a single image, and an Erase mode that composites several successive shots into one to remove the pesky person who walked into the shot as you were taking it. With the Galaxy S 4, Samsung has done a good job of tweaking its already-customized version of Google's Android Jelly Bean (4.2.2) operating system. There are changes that make the interface smoother and make it easier to access what you need. For example, in the notifications bar, you can choose the settings options you always want access to. This way, if having airplane mode is uber important to you as a frequent traveler, you can keep that shortcut front-and-center. Additionally, Samsung has added a bunch of alternative navigation options. Now, the phone will detect when you're looking away from a video and pause the video until you look back at the display (A feature that will also be available on the LG Optimus Pro). Or, instead of swiping through pictures in an album, you can simply wave your hand to move on to the next image. Or, use your eyes to scroll through text. I tried the swiping and pausing, and those were a bit finicky but worked. If anything they'll take some getting used to in practice, but that's something I won't know for sure until I've actually lived with the S 4 phone. Like LG's Optimus G Pro and HTC's One, the S 4 has a built-in infrared controller so you can use the phone as a remote control. Smartphones continue their march towards becoming a complement to your TV screen. Meanwhile, the other place that Samsung innovates is its inclusion of a plethora of lifestyle software. S Health, for example, includes a step tracker and can tie into forthcoming Samsung S heart rate monitor and body scale accessories, as well as third-party blood sugar and blood pressure monitors. S Note supports finger-scribbled input. S Translate will translate between 9 different languages like Google Translate, but adds its functionality to the Samsung ChatOn messaging app. And, tweaks to the on-board Google-based Navigation make the built-in GPS that much easier to use while driving. Samsung will offer 16GB, 32GB, and 64GB variants of the S 4. Plus, a microSD card slot will let you bump the capacity by up to 64GB. The Galaxy S 4 will have a large 2600mAh battery. That's bigger than the HTC One's 2300mAh, and a big bump from the S 3's 2100mAh battery. That large battery should help power the S 4 through a day's use, even over power-draining 4G LTE. But there may be a gotcha: I felt the demo unit at the event get very hot during use, and a message even popped up warning that I couldn't do something because the handset was too warm. Ooops. We'll have to see what the actual shipping S 4 brings. 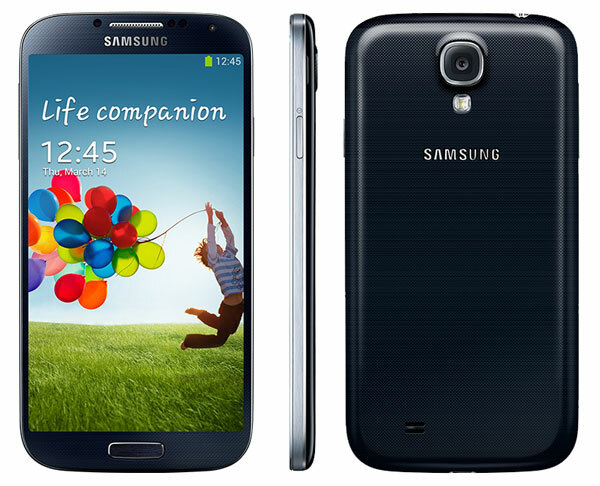 The Samsung Galaxy S 4 will start rolling out in April. Carriers will include AT&T, Sprint, T-Mobile and Verizon. Colors include black and white. Meanwhile, you can pick up the current Galaxy S 3 for as little as $.01 on Amazon Wireless. Any phone by Samsung is not worth it. I went through 5 Samsung phones in one year. They’re all junk. I’ll never buy another one again. Our experiences with recent models have been very positive. Which models did you have issues with and what problems were you experiencing?